The nursery rhyme, which was was first published in 1830, is based on an actual incident involving Mary Elizabeth Sawyer, a woman born in 1806 on a farm in Sterling, Mass. Spoiler: its fleece *was* white as snow. Birth-place of Mary Sawyer and the little lamb. Sterling, Mass. Photography Art and Picture Collection, The New York Public Library. The nursery rhyme, which was was first published in 1830, is based on an actual incident involving Mary Elizabeth Sawyer, a woman born in 1806 on a farm in Sterling, Mass. In 1815, Mary, then nine, was helping her father with farm chores when they discovered a sickly newborn lamb in the sheep pen that had been abandoned by its mother. After a lot of pleading, Mary was allowed to keep the animal, although her father didn’t hold out much hope for its survival. Against the odds, Mary managed to nurse the lamb back to health. “In the morning, much to my girlish delight, it could stand; and from that time it improved rapidly. It soon learned to drink milk; and from the time it would walk about, it would follow me anywhere if I only called it,” Mary would later write in the 1880s, many decades after the incident. And, yes, the lamb would indeed follow her wherever she went and did have a fleece as white as snow. The lamb grew up and would later have three lambs of her own before being gored to death by one of the family’s cows at age four. Another tragedy struck soon after when Roulstone, by then a freshman at Harvard, died suddenly at age 17. Here’s where the controversy begins. In 1830, Sarah Josepha Hale, a renowned writer and influential editor (she’s also known as the “Mother of Thanksgiving” for helping making the day a holiday), published Poems for Our Children, which included a version of the poem. According to Mary herself, Roulstone’s original contained only the three stanzas, while Hale’s version had an additional three stanzas at the end. Mary admitted she had no idea how Hale had gotten Roulstone’s poem. When asked, Hale said her version, titled “Mary’s Lamb,” wasn’t about a real incident, but rather something she’d just made up. Soon the residents of Sterling and those of Newport, New Hampshire, where Hale hailed from, were arguing about the poem’s provenance – something they continued to do for years. In the 1920s, by which time both Mary Sawyer and Sarah Hale were dead, none other than Henry Ford, the man who revolutionized the auto industry, leapt into the fray. The inventor sided with Mary’s version of events. 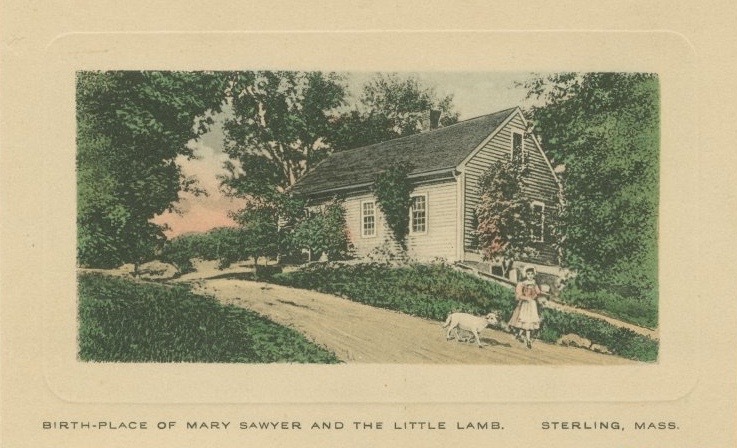 He ended up buying the old schoolhouse where the lamb incident took place and moved it to Sudbury, Mass., then published a book about Mary Sawyer and her lamb. In the end, it seems the most logical explanation is that Hale simply added the additional stanzas to Roulstone’s original (which she’d probably gotten wind of at some point). But wait! There’s a third version of how the Mary and her lamb story came to be. Across the pond in Wales, Mary Hughes, of Llangollen, Denbighshire, was credited with being the subject of the nursery rhyme supposedly penned by a woman from London by the name of Miss Burls. The only problem with the U.K. version of events is that Mary Hughes wasn’t born until 1842, twelve years after Hale’s poem was published. In the end, the nursery rhyme took on a life of it’s own after it was set to music. It became wildly popular beginning in the mid-1800s. The poem even became the first audio recording in history when Thomas Edison recited it on his newly invented phonograph in 1877 in order to see if the machine actually worked. It did. Listen to it here. Back in Sterling, Mass., they continue to celebrate Mary Sawyer. There’s a statue of the famous lamb in town, and a restored version of Mary’s home (the original was destroyed by a pair of arsonists back in 2007). Her descendants continue to farm the land that gave birth to the most famous nursery rhyme of all time.